Newlywed Isobel Shaw lost everything. The king’s men seized her property and killed her husband. Turned out of her home, she sets out on foot for her family’s estate in the Highlands of Scotland. Highland rake Charlie MacDonell is on his way home. After five years abroad as a mercenary soldier, he has realized he’ll never outrun his troubled past. When he meets Isobel on the road, she assures him she’ll manage quite well on her own. He admires her stubborn self-reliance but refuses to leave her alone and defenseless. As they travel together, he finds himself wanting more. To his surprise, she’s immune to his charms—and he’s helpless to hers. 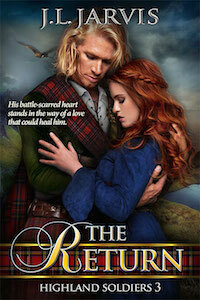 Book 4 in the Highland Soldiers series, Scottish historical romances set during the turbulent Covenanter times of seventeenth century Scotland.